Over the years, life takes on more flavor. 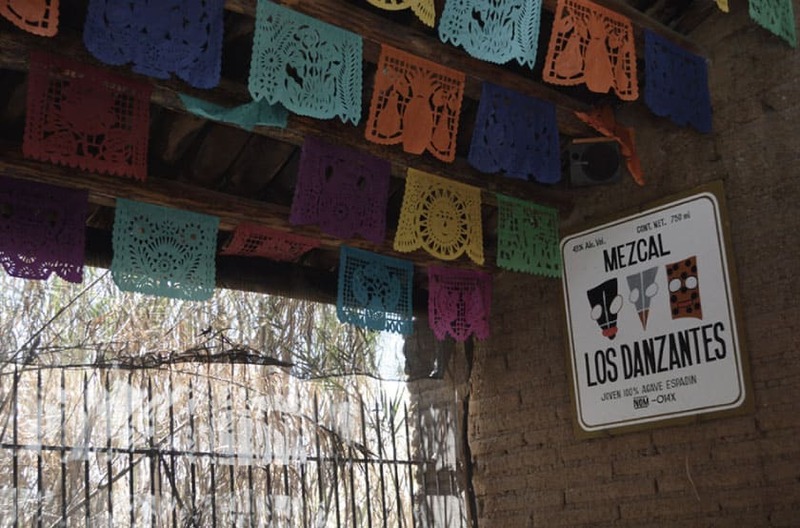 Los Danzantes Mezcal honors our roots and connects us to our Mexican identity. It is produced using artisan techniques by production director Karina Abad and master mezcalero Joel Antonio at Los Danzantes Distillery, located in Santiago Matatlán, Oaxaca. 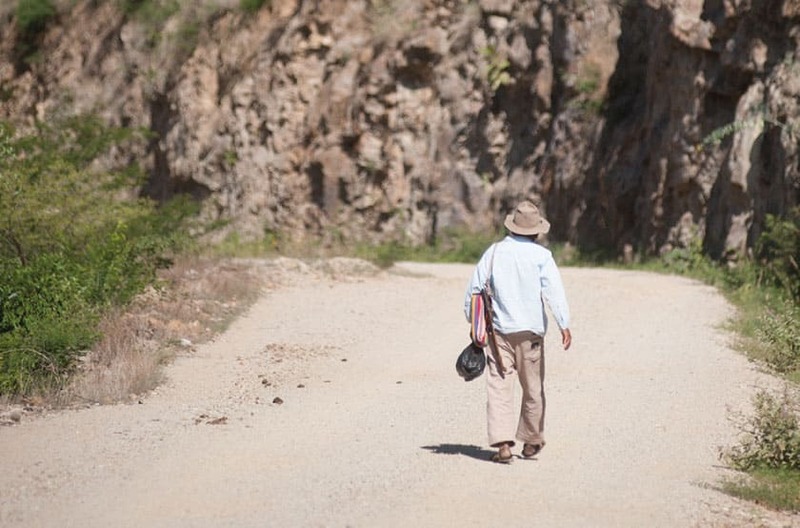 We first experienced mezcal in the mid 1990s while travelling around Oaxaca. From the first sip, we felt a buzz on our palates that began in our mouths and went straight to a sacred place in our hearts. At that very moment, something visceral stirred in our minds and from then on – we knew it was our duty to share this experience with the world. This is the path we took – a lengthy road involving considerable perseverance. On July 8, 1997, we bought a traditional mezcal distillery in disuse in Santiago Matatlán, Oaxaca. We started our project with a five-year outlook in mind, but those five years eventually became twenty. Our story is called Perseverance. In the 1990s, Mexico was not yet ready for the mezcal market– but we were sure that time would come. From then on, our commitment has been aligned around respect – respecting artisan production methods; respecting the earth while learning from people who have made mezcal for generations; respecting the plants’ growing cycles and understanding that it is this very plant that bestows its gifts upon us. 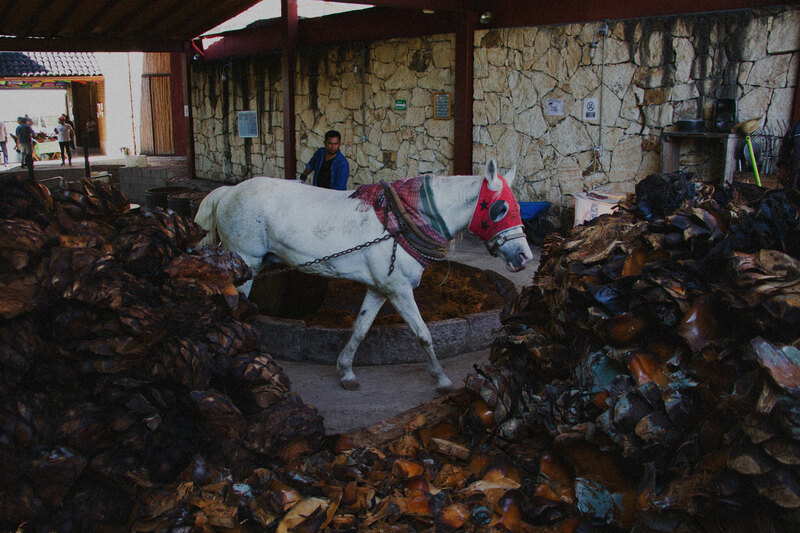 Using artisan techniques to produce mezcal means understanding the origin of the product, from the jima del maguey (cutting the stalks off the heart of the maguey), to bottling. 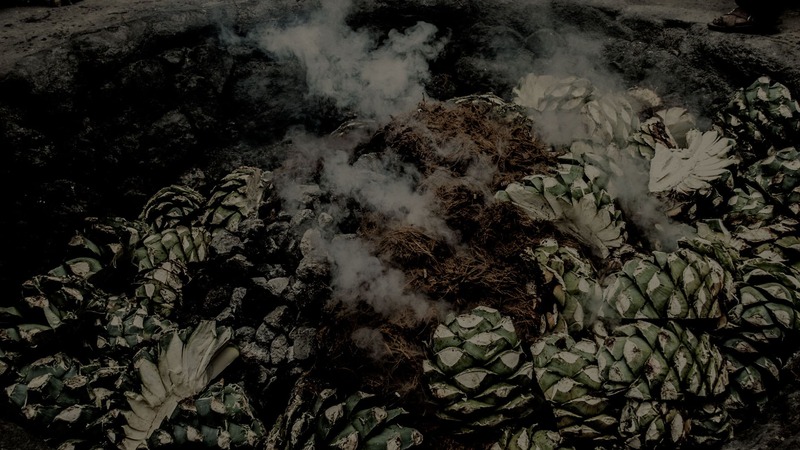 For us, mezcal has involved an emerging awareness, a way of singing the praises of our traditions and of recognizing the product’s artisanal roots with great pride, all the while honoring Mexico. 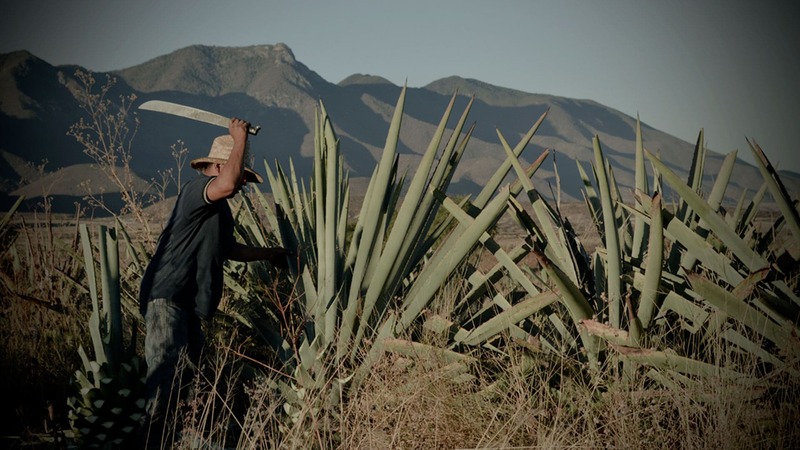 Once the maguey reaches maturity, it is extracted from the earth that nurtured it for so many sunny days and its stalks are cut off with a machete. The maguey then starts the journey that will turn it into mezcal. For six hours beginning at dawn, burning wood warms the river stones heating the inside of the oven. 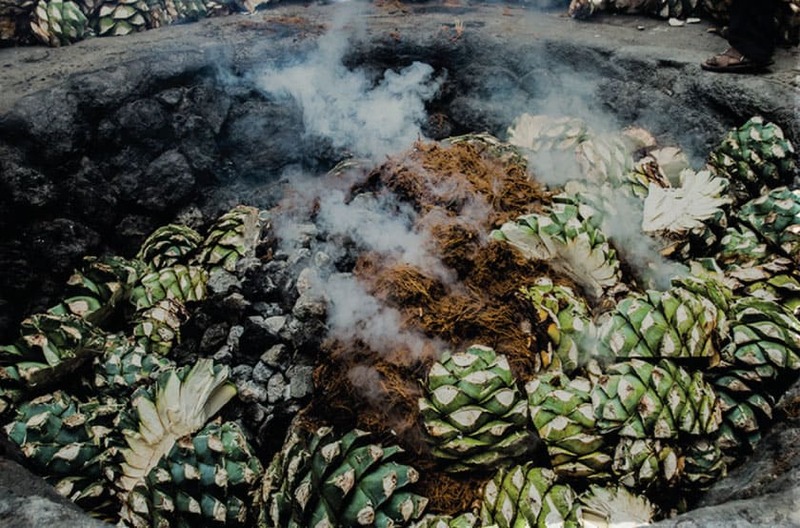 Then they are covered with a damp coating of maguey fibers, on top of which are placed the piñas (the heart of the maguey) in the shape of a pyramid. Finally, everything is covered with a layer of empty sacks and sealed in the underground oven for three days. 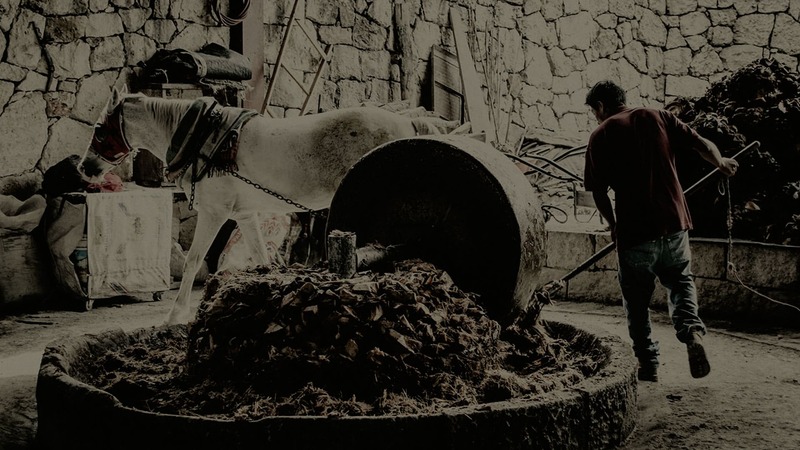 Once the maguey is removed from the warm interior of the earth and cooled, it is crushed in a stone mill, where Samson the horse pulls a quarry rock wheel. The action of the quarry rock wheel releases the sugars and juices that later become alcohol. The pulp and juices are placed in wooden vats, where fermentation takes place naturally. Over six days, the yeast does its work and converts sugar into alcohol. At Los Danzantes Distillery, fermentation happens with classical music playing in the background, so the yeast can absorb good vibrations while it does its work. After passing the five senses test by our master mezcalero, we move on to the distillation process. The fibers and tepache (a drink made from fermented pineapple juice) are placed in the copper still to begin the double distillation process. During the first distillation we separate solids and other impurities from the liquids to obtain what we call ordinario, which is between 25-30% alcohol. During the second distillation, we refine the product, separating the ends, body, and tails, and extracting the aroma and flavors produced during fermentation. 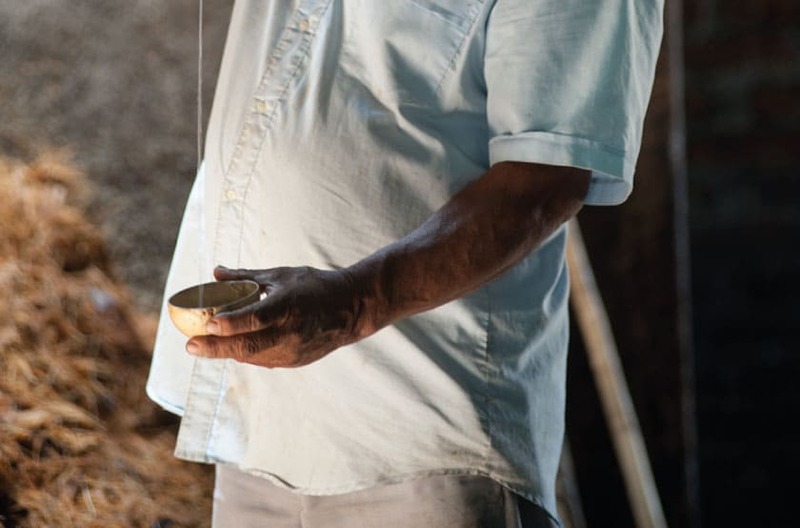 Then, a master mezcalero uses a technique called veneciar – with the help of a hollow cane and a calabash bowl – to measure the alcohol content. 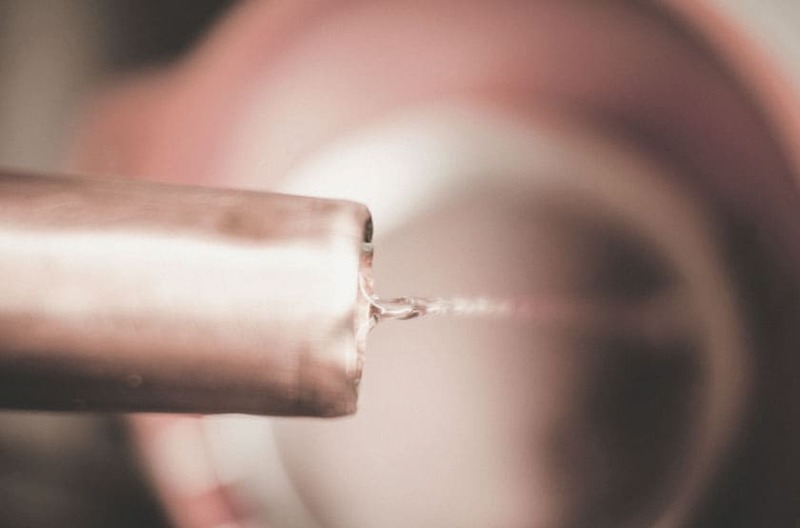 He does this by observing the shape, size and duration of ‘pearling’, a traditional technique used to measure alcohol content. Nature endows us with as much diversity as aromas and flavors. This artisanal mezcal is produced with 100% Espadín (Agave angustifolia Haw. ), hand-harvested from the Oaxaca Valley plains. It is infused with flavors of the earth, volcanic rock and local woods that awaken our senses and connect heartfelt emotions. The Espadín maguey is from the Oaxaca Valley. Produced at Los Danzantes Distillery in Santiago Matatlán, Tlacolula, Oaxaca. Artisanal maguey selection from the Oaxaca Valley. Roasted in a stone-lined, wood-fired roasting pit. Milled using a horse-pulled millstone. Natural fermentation in 800-liter pine vats with yeast native to the region. Double distillation in copper stills. Mezcal with CRM (Mezcal Regulatory Council) certification, and Official Mexican Standard NOM-070- SCFI-2016 and its DO (Denomination of Origin). Aroma: Well-balanced aromas of roasted maguey blend with a mix of green herbs and sharp freshness. Palate: Light, refined flavors marked by hints of sweet citrus at the peak, with strong lingering notes of roasted agave, a persistent citrus flavor and smoky aftertaste. Silky, balanced flavors that are round and smooth, and spread equally throughout the entire mouth. This mezcal reveals everything and its strong legs and reliable aroma do not disappoint. The initial taste brings on notes of light fresh fruit, with a middle that calls into play concentrated green herbs, and then moves on to the sweet flavor of roasted maguey and a finish reminiscent of smoke and wood, including a strong lingering aftertaste that is generous in the throat and stomach. This mezcal is an excellent digestive, aperitif and accompaniment to food. It pairs well with Oaxacan ingredients such as Mexican pepperleaf, mole (green and yellow), tlayuda, tasajo (thinly-sliced grilled beef), cecina (dried/cured meat), heavily-seasoned dishes, and markedly sweet desserts. Mezcal made from maguey Espadín (Agave angustifolia Haw. ), and aged for nine months: 70% of the time in American white oak barrels and 30% of the time in French white oak barrels. Our barrels are used solely by Los Danzantes Distillery, resulting in that lasting flavor that lingers on your palate. Produced at Los Danzantes Distillery. Mezcal made from maguey Espadín that has been aged for nine months: 70% of the time in American white oak barrels and 30% of the time in French white oak barrels. Our barrels are used solely by Los Danzantes Distillery. Aroma: Subtle and elegant aroma with smoky, earthen accents and touches of vanilla and maple syrup. Palate: Strong flavors, sweet, well-balanced alcohol content, subtle. Well rounded, elegant, robust and sparkling on the palate. A combination of flavors that come and go, such as coconut, strong notes of vanilla and wood as well as damp wood and sweet flavors that prolong the excellent aftertaste. An excellent accompaniment as a digestif or with desserts that include vanilla, cinnamon or chocolate. Delightful with chocolate de metate (hand-ground chocolate). Mezcal made from maguey Espadín (Agave angustifolia Haw. ), aged for 16 months: 70% of the time in American white oak barrels and 30% of the time in French white oak barrels. Its color transports us to the past, but its flavor brings us right back to the present. Produced at Los Danzantes Distillery. Mezcal made from maguey Espadín that has been aged for 16 months: 70% of the time in American white oak barrels and 30% of the time in French white oak barrels. Our barrels are used solely by Los Danzantes Distillery. Color: clean, brilliant and crystal-clear amber, with solid legs. Aroma: an elegant and subtle bouquet, with accents that are smoky and earthen accompanied by notes of ripe fruit and caramel. Palate: An excellent balance of vanilla and woody flavors that develop into sweet vanilla and cinnamon, ending with intense redwood and a strong, very robust, but elegant aftertaste. Its flavors become quite refined and balanced on the palate, without astringency or tannin. An excellent digestif that is ideal with vanilla, chocolate or strawberry ice cream. Artisanal roasting process in a stone-lined, wood-fired roasting pit. Natural fermentation in 800-liter pine vats with yeast native to the region. Color: Crystal clear, with thick, solid legs. Aroma: A delightfully fresh bouquet, distinguished by its sweet smell and a depth of bittersweet notes of quince, roasted maguey and fluctuations of sharp freshness. Los Danzantes Tobalá is like candy for the palate, introducing a rainbow of very complete and complex aromas. Palate: Fresh and refined flavors, perfectly balanced. The first part of the mouth delights in light and refined notes of citrus fruit; the middle part of the tongue receives notes of light sweetness, and a finish reminiscent of concentrated green herbs and marked by an aftertaste that plays on light smokiness. The flavors dance gently on the throat and stomach. This is a noble mezcal whose flavors do not betray its high alcohol percentage. An excellent aperitif as an accompaniment to Mexican pepperleaf, chintextle (smoked chili paste), tart sauces, and fruit salad. This artisanal mezcal is produced using 100% maguey Espadín (Agave angustifolia Haw. ), from the Oaxaca Valley plains. Distilled three times, the last distillation involves a combination of seasonal fruit, spices and a creole hen. Finally, the elixir is dyed with Grana Cochinilla. This is a special offering to our gods and to everything that you kiss with your mouth. Hand-selected maguey roasted using artisanal techniques in a stone-lined, wood-fired roasting pit. 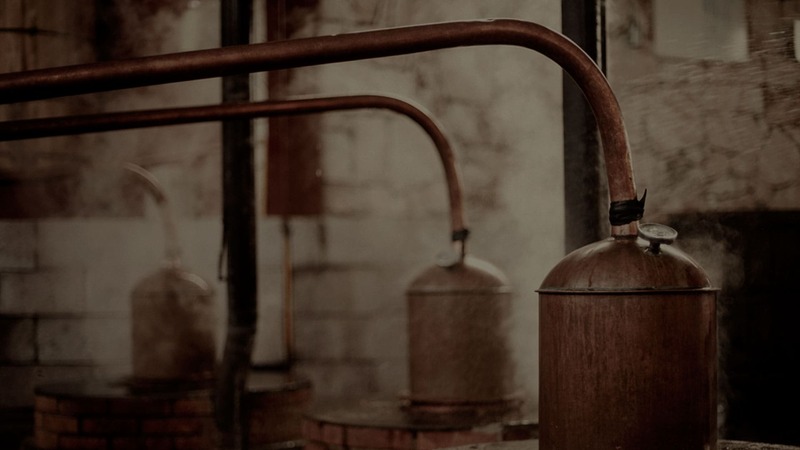 Distillation: This mezcal is distilled three times in copper stills. The third distillation is carried out with a recipe that includes seasonal fruit, spices and a creole hen (mounted on the still) – all parts of an artisanal process that separates and captures the essence of each stage in the artistic process. 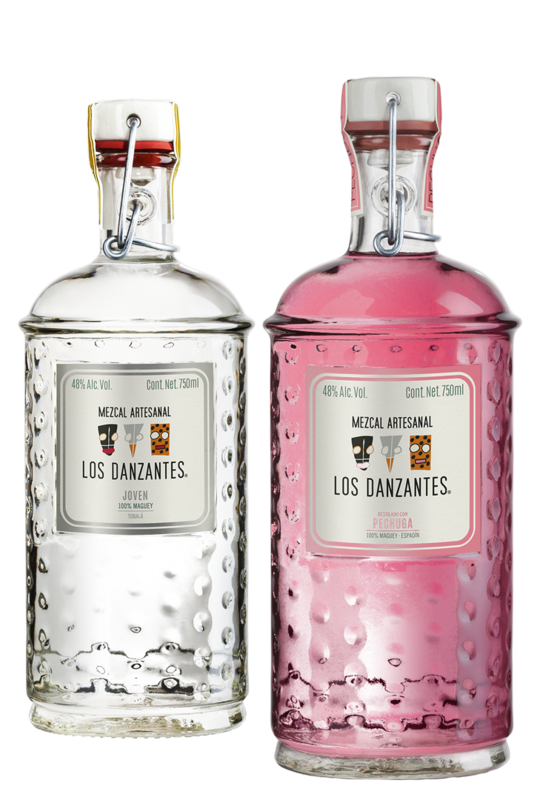 Finally, Los Danzantes Pechuga is dyed with Grana Cochinilla, giving it its red color, which does not affect the mezcal’s flavor. Aroma: Wafts of anise and citrus, where orange is prevalent, with notes of tamarind. Palate: Its fresh flavor contains traces of grated oranges and lemon juice; its pomegranate red color is clean and brilliant. This mezcal is a special type of digestif that smoothly accompanies desserts with its spiced notes, especially designed for knowing palates of enthusiasts of European digestifs spiced with herbs. Try with crème brûlée, chocolate and vanilla. 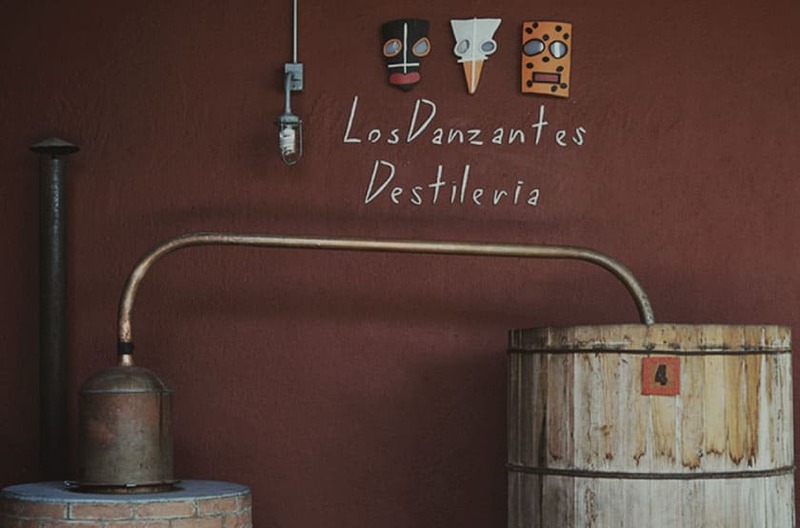 Los Danzantes Distillery was founded in 1997 in Santiago Matatlán, Oaxaca. 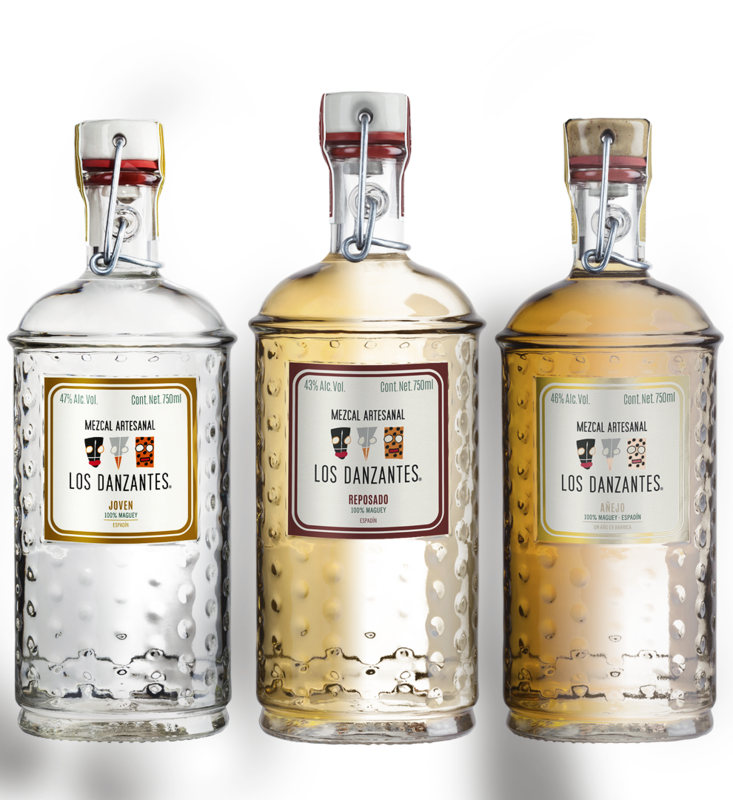 Los Danzantes Distillery’s mezcal brands include Los Danzantes and Mezcal Alipús, as well as Proyecto Maguey. 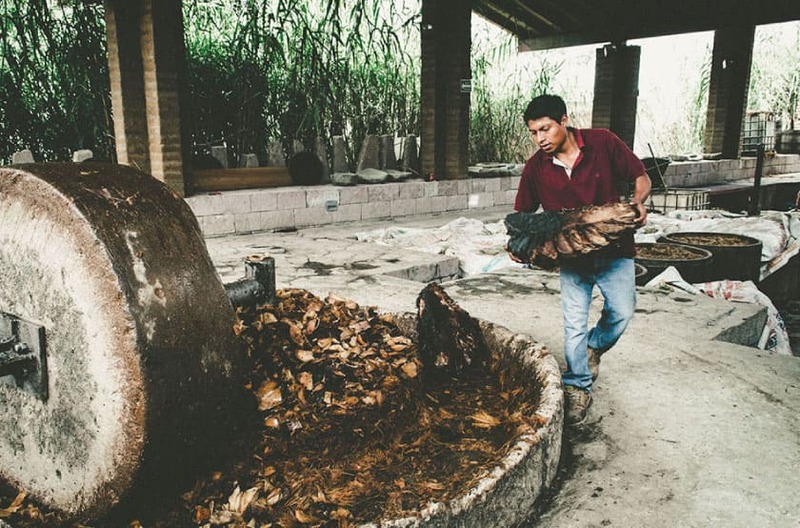 Our corporate philosophy is grounded in protecting and maintaining the traditions of artisanal mezcal production. We are a company committed to maguey conservation and to encouraging advancement for artisanal mezcal producers and their culture. 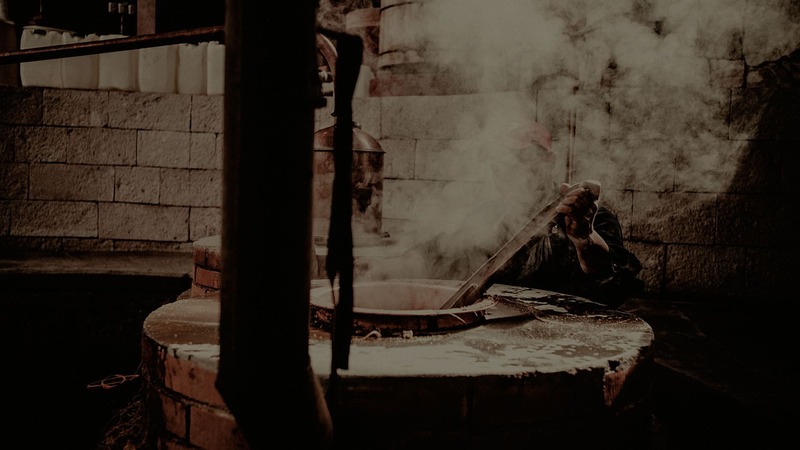 We hold ourselves accountable for the quality of our product, which is 100% artisan-produced mezcal, and which we offer to numerous world markets with honor and pride. We offer a variety of mezcal products based on quality services, raising Mexicans’ awareness about their heritage and identity as well as advancing prosperity for families involved in this sustainable value chain. With clearly defined goals, we value the strengths of the individuals involved in the production process through our commitment to transparency in management and continuous process improvement. We emphasize the importance of creativity, communication, and ongoing organizational development in supporting harmonious teamwork. 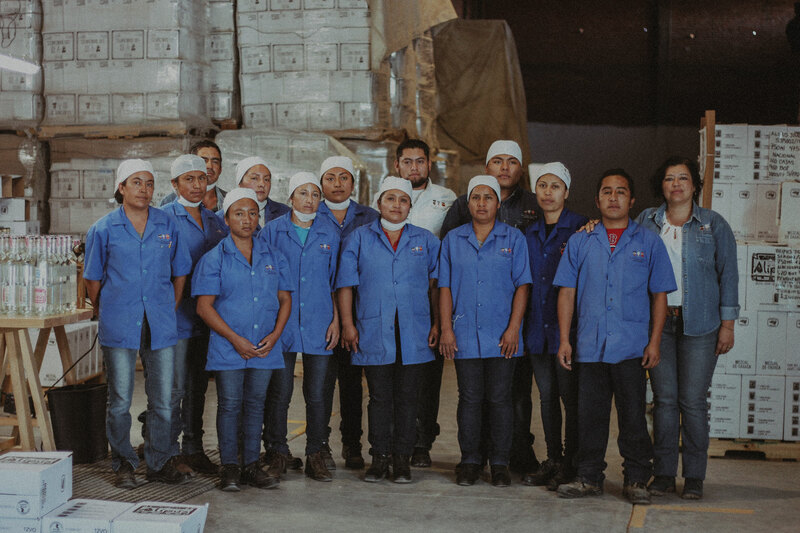 Our warehouse is located in the town of Unión Zapata, Oaxaca – a location where a number of activities take place that are essential to the work that goes on daily at Los Danzantes Distillery. Our bottling and labeling areas are located here, and these processes are based on our philosophy of supporting artisanal methods. 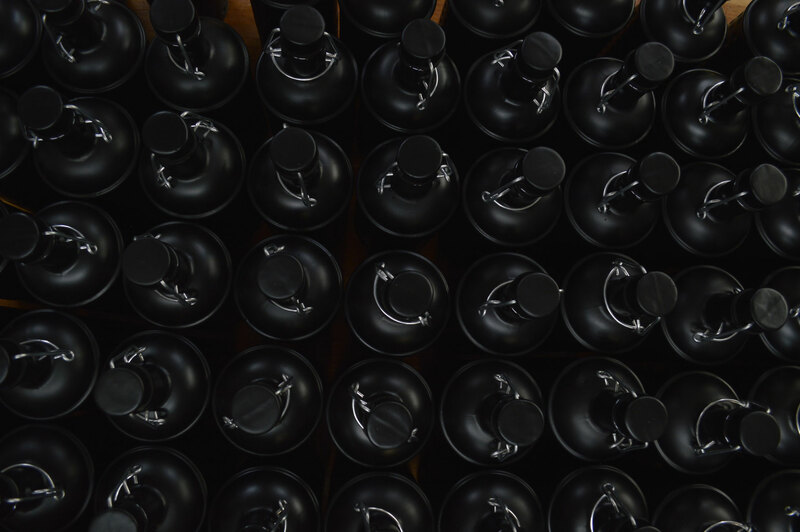 Bottling and labeling are done by hand by a team of women from Santiago Matatlán and Unión Zapata. 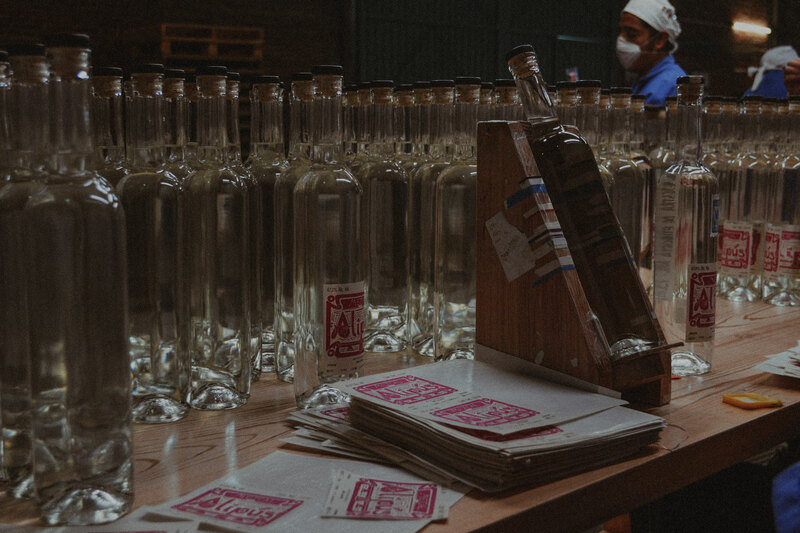 When you see a bottle of Los Danzantes or Alipús mezcal you can appreciate the meticulous effort that employees take each day to produce an exceptional end product. Outside the warehouse is our small ethnobotanical garden where we have various species of maguey as well as some special species used to make mezcal in a number of regions in the state of Oaxaca. We also have a small nursery with some of the maguey species from Proyecto Maguey that we raise in collaboration with the University of Chapingo in Zimatlán, Oaxaca and the Yucatán Scientific Research Center. 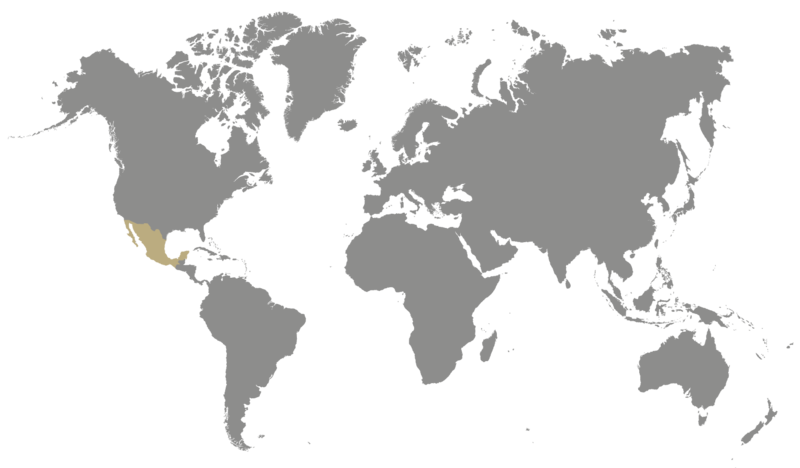 Oaxaca, in terms of the diversity of species found there. 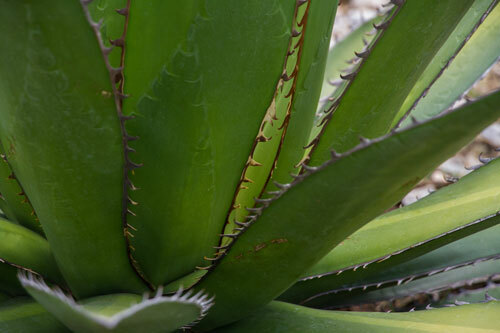 Mezcal’s richness comes from its source – the maguey. 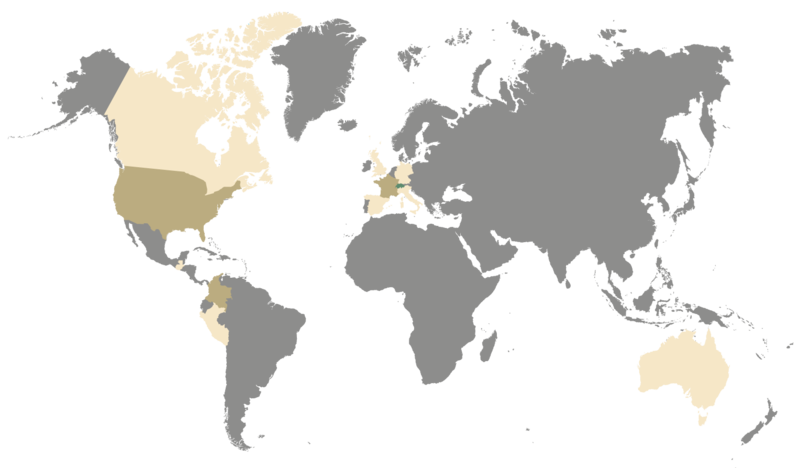 The maguey in turn reflects Mexico and in particular, Oaxaca, in terms of the diversity of species found there. 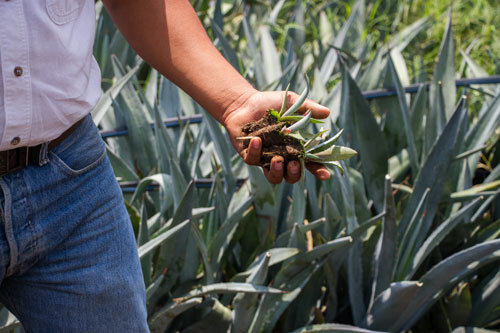 Over the years Los Danzantes’ understanding has evolved, and we have learned that continuing development is only possible if we commit to respecting the raw material: the maguey. Since 2012, our first seedbeds in nurseries in Tobalá have taught us that it is essential to give back to Nature everything she gives us. In 2014, we began a breakthrough research project with resources from CONACYT (National Science and Technology Council) in support of a rescue program for wild and semi-cultivated maguey. 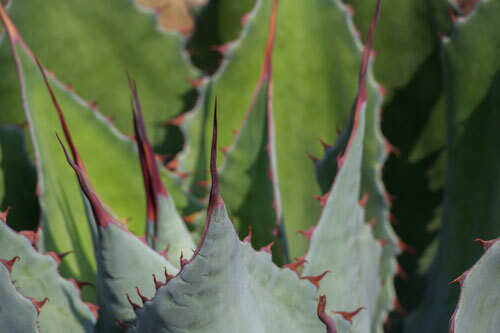 This innovative work was possible through a cultivation technique involving plant tissue that capitalizes on the asexual propagation of the maguey plant. In collaboration with the Yucatán Scientific Research Center and the University of Chapingo, we have collected more than 100 specimens from 20 species, and have managed to reproduce 14 specimens with this technique. This has created a germplasm bank that has proliferated 300,000 plants from 12 species. In 2016, the first Arroqueño, Mexicano coyote and Cincoañero maguey plants were planted under a reforestation and sexual reproduction program, with 10% of the projects’ plants placed in the four regions where the mother plants were obtained. 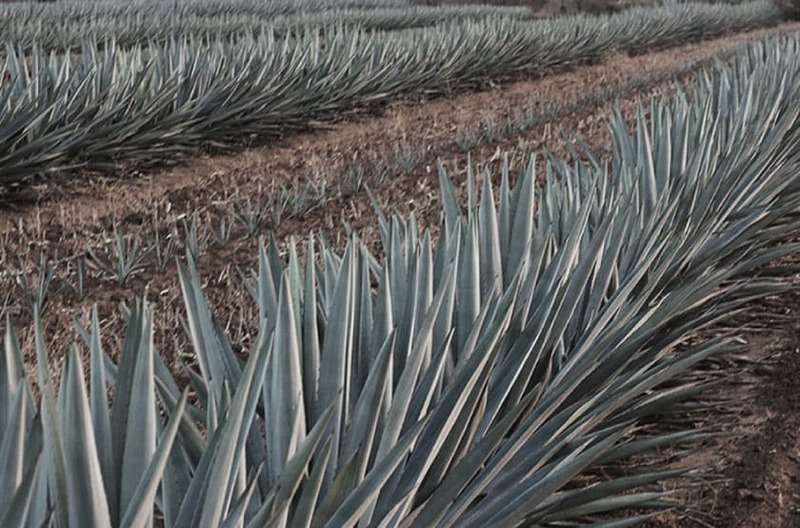 We are aware that without Maguey, there is no Mezcal.